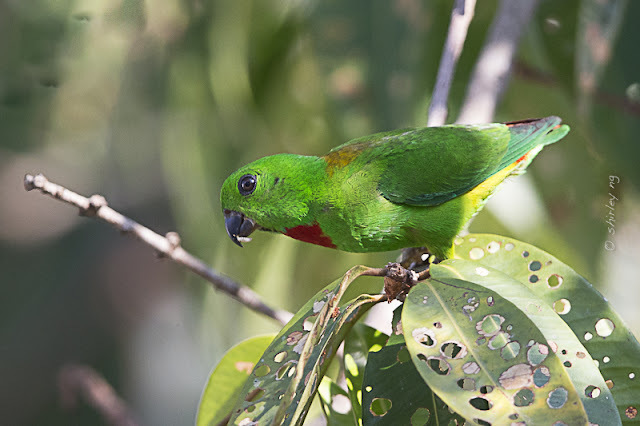 Often we hear the high pitched honking calls of the blue-crowned hanging parrots as they zip around the Little Red Dot. 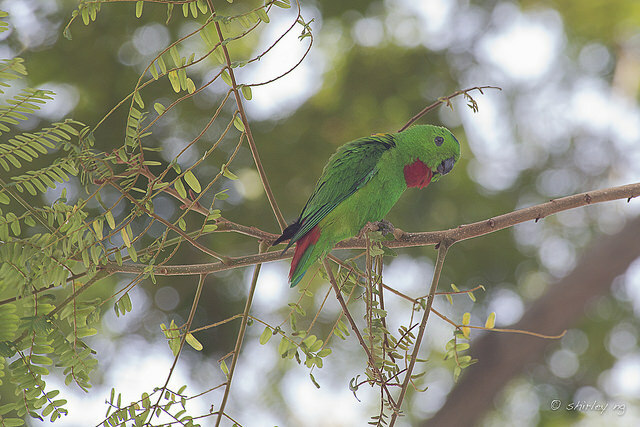 They are also the only parrot that you will hear along the busy roads of our business district. This is because they favor the yellow flame trees that are planted along the roads, which provide them with food and ideal nesting holes. Their diminutive statue and green color make difficult to spot among the leaves. They are also not as noisy as the parakeets and can move quietly among the foliage. It takes a lot of patience and ignoring stares of people around you as you peer closely at a tree to spot them. Can you spot the parrot? Although they are nectar and fruit feeders, they need protein too to survive. In the wild, nature provides them with larvae. 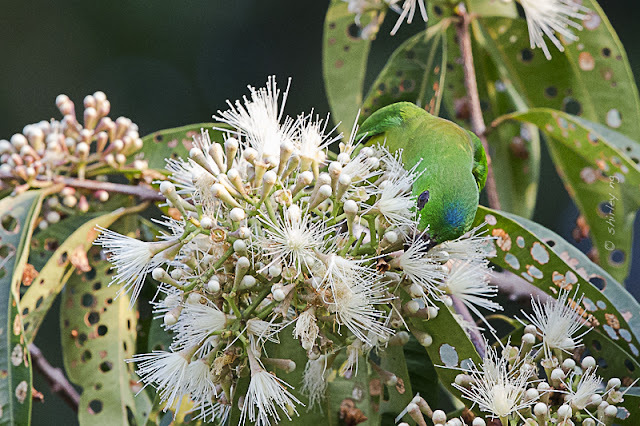 In the photo below you'll see a parrot drinking nectar. 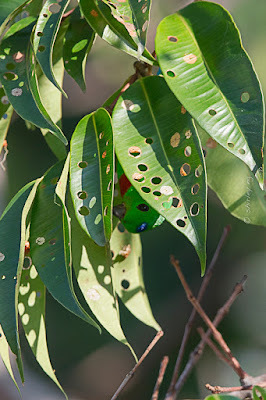 Look at the leaves of the tree, they've been punched full of round holes. These holes are the result of an infestation of bagworm moth larvae. 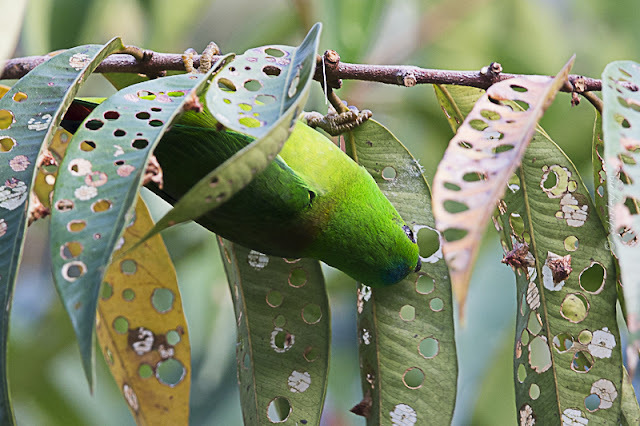 I was lucky to have seen photos from a friend who had photographed these parrots doing something unusual, they were harvesting larvae to eat. Spent some time to document this behavior plus I couldn't resist getting better shots of the handsome male blue-crowned hanging parrot. 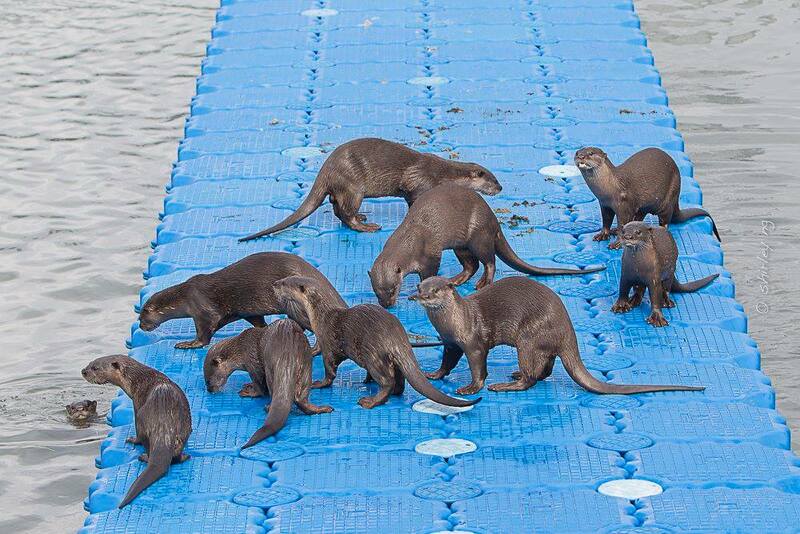 How many species of otter world wide? Many may not know that we have only 13 species of otters world wide, and all of them are on the IUCN Redlist. Some of my friends have been urging me to start writing again. Since I wasn't teaching and still nursing a cough, I thought I'd refresh my blog and also write an update. 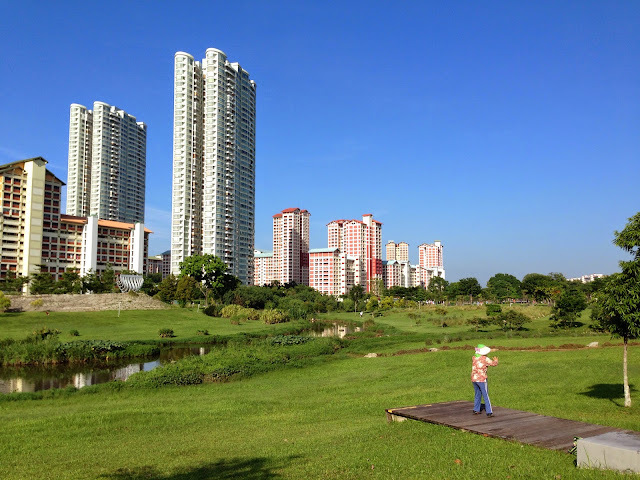 The pair had another litter of five pups in the Kallang Basin area at the beginning of 2016. Since then they've been in the media darlings. BBC News called them "Singapore's celebrity urban otter family". NatGeo Wild, referred to them as the river-siders in their documentary - Otter Town that was recently released in the US. The family is also in the running to be our 51st icon to represent our nationhood. They also delighted many of the delegates from the 13th International Otter Congress 2016, which was held here in Singapore. 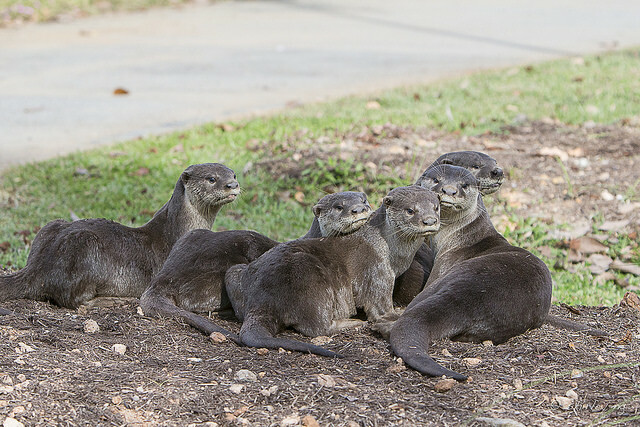 The International Otter Congress, held once every few years, gathers members of the International Union for Conservation of Nature (IUCN) Otter Specialist Group (OSG) to discuss conservation statuses, future strategies and threat mitigation for the 13 otter species. 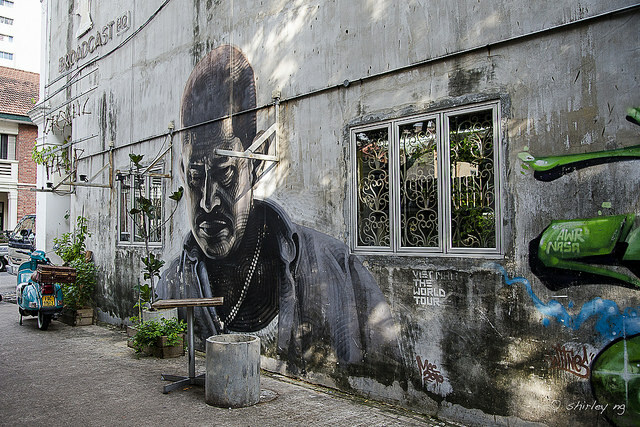 I was in Little India having some fun locating street art in the back alleys. While photographing people who collect cardboard boxes for recycling, I heard a familiar tweeter of my little nemesis - the blue-crowned hanging parrot. It sounded close, like directly above me.